Ademola Lookman has pledged his future to England after holding face-to-face talks with Under-21 head coach Aidy Boothroyd over persistent stories linking him to Nigeria. The Everton winger was part of the Under-20 squad that won the World Cup in 2017 and he will have a significant role to play for the Under-21s next summer in Italy, as they bid to build on their promise and win Euro 2019. However, Lookman has been the subject of concerted interest from Nigeria, whose manager Gernot Rohr is preparing for next summer’s Africa Cup of Nations and said three weeks ago that he ‘wanted to change his mind so he can play for us as he will add something to our team’. 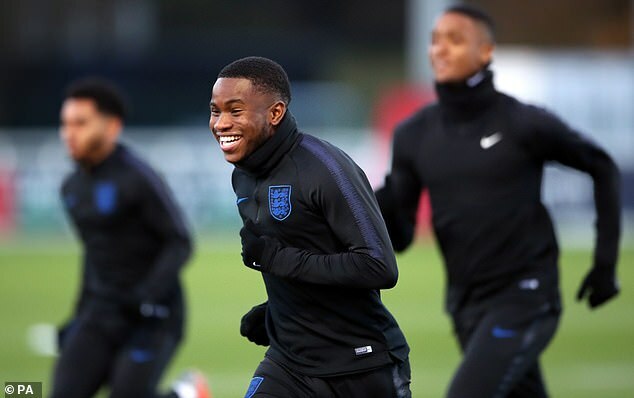 The Football Association have been aware of Nigeria’s interest in him for some time but Boothroyd spoke with Lookman, 21, at St George’s Park last week and has been assured that he is committed to representing England. Lookman has endured a difficult year. His heart was set on a move to Germany to join RB Leipzig but Everton refused to do business and he found himself out of Marco Silva’s team, but the last month has seen an upturn in his form. ‘He’s had a tough time of it, but he’s been better recently,’ said Boothroyd. ‘He got himself into a state over summer when he didn’t know where he would be playing or if he would be moving or not. Now he has just got his head around the fact that wherever it is he is playing, he has to play well.